I have loved mysteries ever since I was a young girl. I grew up reading all of the Nancy Drew books as well as Trixie Belden and even a few Hardy Boys. However, it seems like there aren't a lot of current mystery books for today's teens. In fact, I can't remember the last time I read a young adult mystery novel! So when I was pitched the new book BLUE VOYAGE by Diana Renn, I jumped at the chance to read it. This mystery which is set in present day Middle East sounded like an intriguing book. Naturally, the setting is terrific, but the main character also sounded pretty darn interesting. And then when you take into account that the book involves a little bit of archeology and a smuggling ring, I was definitely interested! BLUE VOYAGE tells the story of Zan, a teenage girl who has already had her fair share of pain. Her father, who is running for Massachusetts governor position, is caught having an affair; and Zan is acting out in the only way she can -- by partying and stealing items at the mall. Zan's entire life is spiraling out of control! Zan's mother decides that Zan and she need to get away and have a mother/daughter bonding experience. They decide to go to Turkey to visit Zan's aunt who has recently lost her husband to a tragic hiking accident. When Zan arrives in Turkey, she discovers that there might be more to the accident than what the authorities initially believed. Things really heat up when Zan and her mother end up taking a cruise along the Turkish Riviera. Zan is feeling pretty left out since most of the people on the cruise are "old folks;" however, there is a another girl named Sage who is close to Zan's age. Zan is drawn to the beautiful, and somewhat mysterious, Sage. When Sage makes a quick exit from the cruise, Zan is shocked to discover that she left priceless artifacts in Zan's backpack... priceless artifacts which just might have been stolen! Zan ends up smack dab in the middle of a smuggling ring and the criminals involved are most likely very dangerous. They believe that Zan can lead them to Sage and ultimately a priceless urn. Zan is determined to get to the bottom of her uncle's death while also trying to keep herself and her loved ones safe. As Zan tries to solve the mystery and find the urn, she isn't sure what to believe or who to trust... and she learns that she first has to believe in herself! One of the best things about this book was the character of Zan. Often times in a complex mystery, the characters are kind of secondary to the plot, but that wasn't the case in BLUE VOYAGE. Zan was a very complicated girl and I think teens are going to love her. She wasn't exactly a good girl at the start of the book, and I feared that she would be difficult to like. However, I really got to understand Zan and see the pain she was in. And that made me root for her to not only solve the mysteries, but also to figure some things out in her life! The novel was written in Zan's voice and I really think that added to my reading experience. It was wonderful to experience Turkey through the eyes of a young girl, but it also helped me to appreciate both the strengths and weaknesses of Zan's character. In addition, I really liked being inside her mind as she tried to figure out who she could trust and what she should do. It was heartwarming to see how much Zan grew up during her travels and how much she cared about others. (This was a drastic turnabout from the first few pages of the novel!) In many ways, BLUE VOYAGE was a coming-of-age story for Zan, and you know how I love those! Another great thing about BLUE VOYAGE were the suspense scenes. The book was paced well with the ending being rather exciting. I don't want to give too much away, but the action scenes were very dramatic and well-written. Not only could I feel the tension, but I could picture the scenery and adventure scenes perfectly. Overall, BLUE VOYAGE was a great mystery for teens. It has a complex mystery with lots of twists and turns, and it also had a solid character in Zan. I also loved how the author incorporated some of Turkey's modern day problems with ancient artifacts into the book. Highly recommended for teens who are looking for good mystery or ones who are interested in archeology and crime. 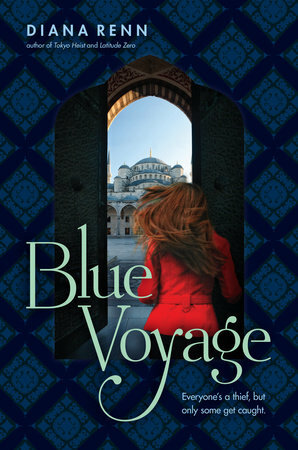 Giveaway alert: I have a copy of BLUE VOYAGE to share with one lucky reader. To enter, just fill out the form below before October 25th at 11:59 p.m. EST. I will randomly select and notify the winner the following day. This contest is open to those of you with U.S. addresses only. Good luck! Loading... Thanks to Saichek Publicity for a review copy of this novel. Mystery Mondays is a regular feature where I review all types of mystery books -- traditional mysteries, suspense/thrillers, and even cozies! Please feel free to share your thoughts on any recent mystery books that you've read. Mystery Mondays is a regular feature where I review all types of mystery books -- traditional mysteries, suspense/thrillers, and even cozies! Please feel free to share your thoughts on any recent mystery books that you've read. Mystery Mondays is a regular feature where I review all types of mystery books -- traditional mysteries, suspense/thrillers, and even cozies! Please feel free to share your thoughts on any recent mystery books that you've read. Now that you mention it, I can't think of a lot of mysteries for young readers. I'm glad there are some to fill that gap. I'd love to win but there is no form to fill out!